NCICS Internships - make a difference! NCICS researchers occasionally work with interns (high school, college, recent graduates) on projects which fit into their scope of activities. The majority of NCICS internships are unpaid, though if funding is available, college students and recent graduates may be considered for a paid internship. NCICS does not provide housing or relocation assistance for internships. 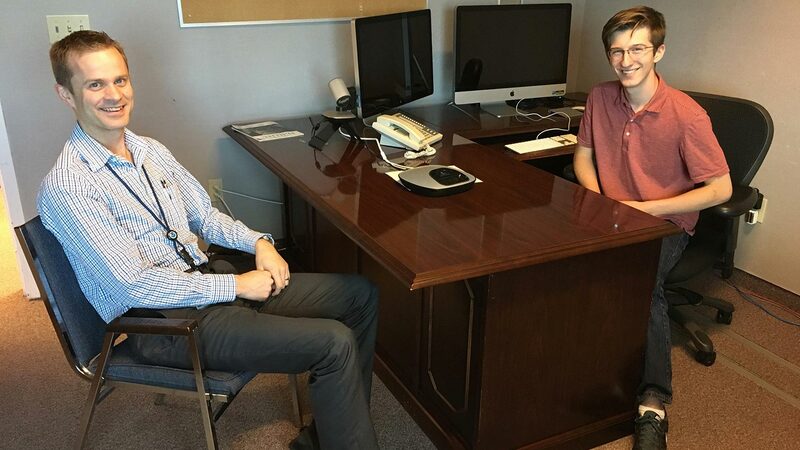 Intern Andrew Dundas (right) interviewing CICS post doc Andrew Ballinger (left). Internships are offered on a project and/or task basis, providing direct support of ongoing research and are targeted to specific skills and needs. Internships may range in length from 1 week to 6 months or longer, depending on the proposal and the accepted project agreement established with the NCICS mentor. A typical intern works 10-20 hours per week. Interns should have an interest in Atmospheric Science, Applied Meteorology and Climatology, Statistics, Computer Science, Communications, or Climate Policy and should possess strong analytical skills, an aptitude for computer programming and languages, the ability to work independently, and an interest in communicating results. For information on current internship positions and details on applying, please see our current internship opportunities page.